Studio shots, no. 78: Peninah Lassiter Woodard Barnes. Penninah Lassiter Woodard Barnes (1858-1919) was the youngest child of London and Penelope Lassiter Woodard. In the 1860 census of Gardners township, Wilson County: farmer Penny Lassiter, 50, and children Priscilla, 14, Theresa, 12, Hardy, 10, Haywood, 8, William, 6, and Penina, 2. Penny claimed $600 in real estate and $300 in personal property. In the 1870 census of Gardners township, Wilson County: farmer London Woodard, 79; wife Penelope, 59; and children Trecy, 20, Hardy, 19, Haywood, 18, William, 15, and Peninah, 12. On 1 January 1877, Simon Barnes, 38, married Pennina Woodard, 17, in Wilson County. In the 1880 census of Gardners township, Wilson County: Simon Barnes, 30; wife Penniney, 21; and children Rosetta, 2, and James, 11 months. In the 1900 census of Gardners township, Wilson County: farmer Simon Barnes, 51; wife Penina, 40; and children Rosetta, 22, James W., 20, Hardy, 18, Charly, 16, Penny, 14, London, 12, Silas, 11, Prisa, 8, Simon, 5, and Marylisa, 2. In the 1910 census of Gardners township, Wilson County: farmer Simon Barnes, 65; wife Pennie, 55; and children Pennie S., 22, Sillas, 17, Mary L., 12, Lucie, 8, Ama, 6, and Simon, 14. Penina Barnes died 24 February 1919 in Gardners township, Wilson County. Per her death certificate, she was born 30 January 1859 to London Woodard and Pennie Lassiter; was married to Simon Barnes; and was a farmer. Informant was Hardy Barnes. Pricilla Hardy died 24 October 1919 in Wilson township. 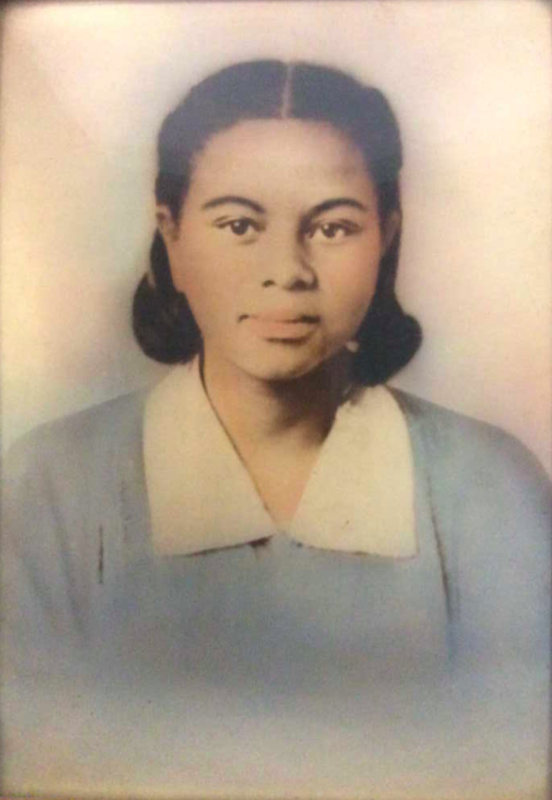 Per her death certificate, she was 28 years old; born in Wilson County to Simon Barnes and Penninah Woodard; was a tenant farmer; and was married. James Walter Barnes was informant. Leonard Barnes died 19 November 1952 at his home at 1312 Carolina Street. Per his death certificate, he was born 26 June 1888 in Wilson to Simon Barnes and Pennina Woodard; and was a World War I veteran. Informant was Pennie Barnes. Treasy Barnes Atkinson died 23 December 1964 in Wilson. Per her death certificate, she was born 4 June 1900 to Simon Barnes and Pennia Woodard and was widowed. Informant was Mrs. Inez Lucas, Wilson. Photograph courtesy of Ancestry.com user rogerbarron52. The Ayantee (1939), the yearbook of North Carolina Agricultural and Technical State University. 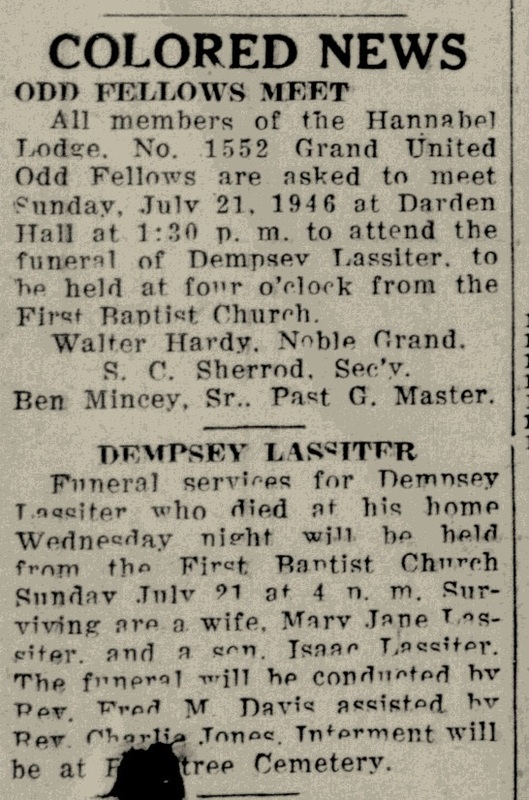 Jesse C. Lassiter Jr. was a 1934 graduate of Darden High School. He is (I think) second from the right on the first row.